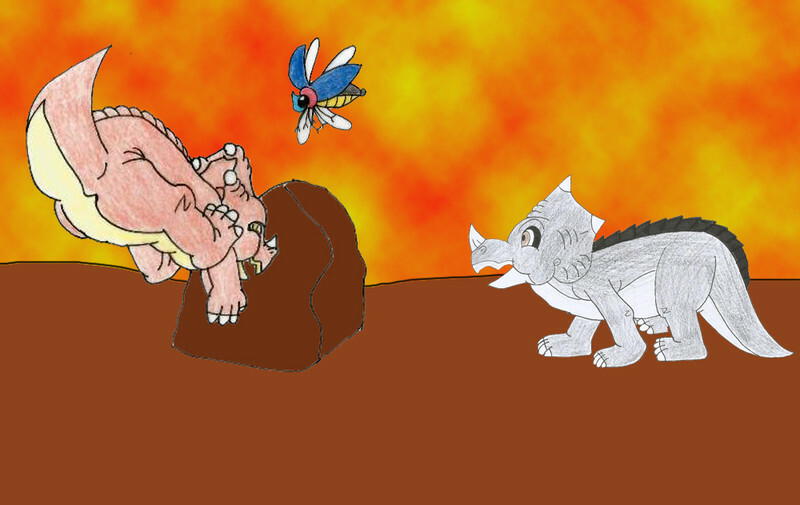 In this topic I will show a loads of drawings of scenarios of what it would have been like if I was in the LBT world. 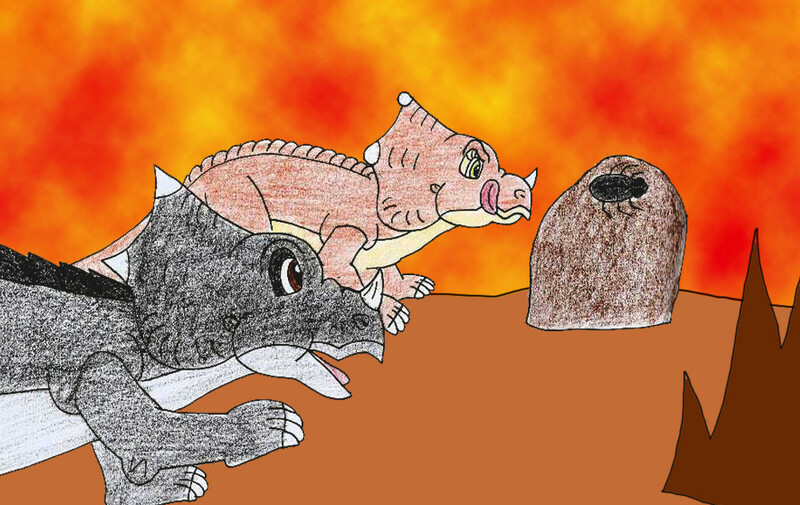 Even since I was a kid I wondered what it would be like if I was a character in the LBT franchise, and what kind of dinosaur would I be. Now that I'm older and got back into the LBT I think I'd most likely and want be a triceratops, for one thing I could be-friend Cera more easily been her own kind. Another reason I think I'd be a triceratops is because throughout my life I have been a little bit like Cera at times ( I can be a bit hot headed and got a lot of bad things from my dad), and my favourite planet eating dino is the triceratops. 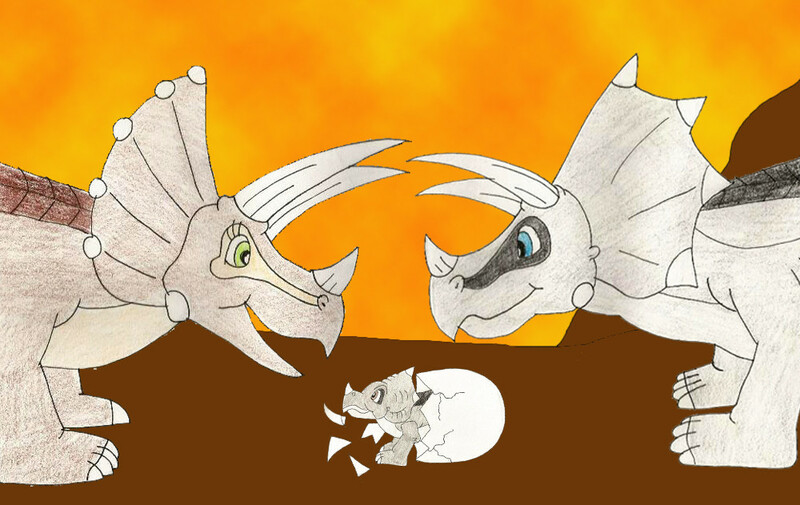 So yeah if I picture myself as a little boy triceratops and who is a long time friend of Cera before the events of the first film. And unlike Cera I had good parenting, and my parents know Cera's dad from childhood and don't like him much cause they know him for what he really is, a prehistoric git. As for a name... Well some of you may have heard that originally Cera was going to be a boy three-horn called Bambo. So I'll maybe got with that name. 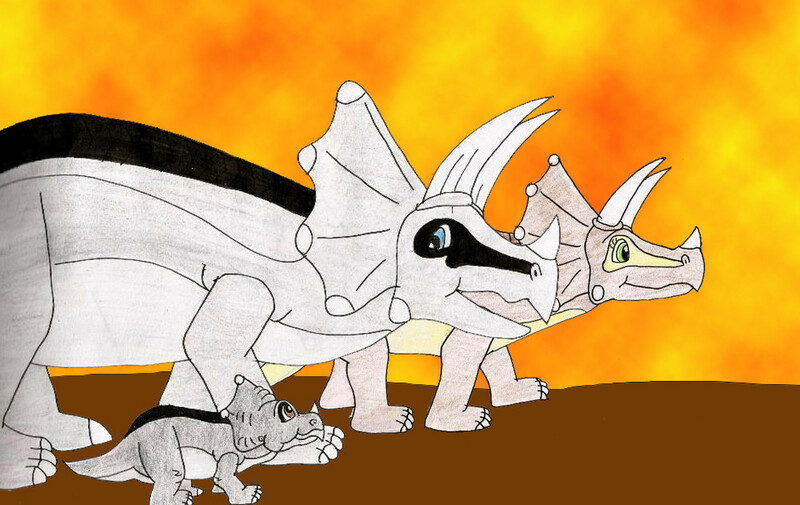 Ok here's the design of me as a young three-horn "Bambo"
The design is a mix of a male version of Cera (kinda like how Ali is a girl version of Littlefoot), and a young friendly version of her dad. I also gave him brown eyes like me. I also to given him a more male look gave him the armoured back like her dad, and made the horns on his frill more pointy. Here is Bambo's birth with his mum "Topsiea" and dad "Topi" watching. Topsiea: Oh it's a boy! He loosk just like you Topi. Topi: What are we gonna call him? Topi: Ah yes I think that suite's him. Now here's baby Bambo nuzzling his mum and dad. Then Bambo notices Cera partly hatched and her 3 sisters running past. Topi: Oh looks Like Topsy's lot are all girls. Bambo gets very interested in the 4 girl three-horn and goes off and follows them. Topsiea: Oh Bambo where are you going? Topi: He seems really interested in Topsy's girls. They make friends right away and nuzzle. This is a big surprise to Topi and Topsy as they disliked each other as kid, and still do. This is also my first ever drawing of Topsy, well as an adult. I have drawn him as a kid in another topic. Not been the best of friends, Topi and Topsy aren't too happy about this. Then Topsiea and Cera's mum step in. BTW I've thought up a name for Cera's mum "Tracey". 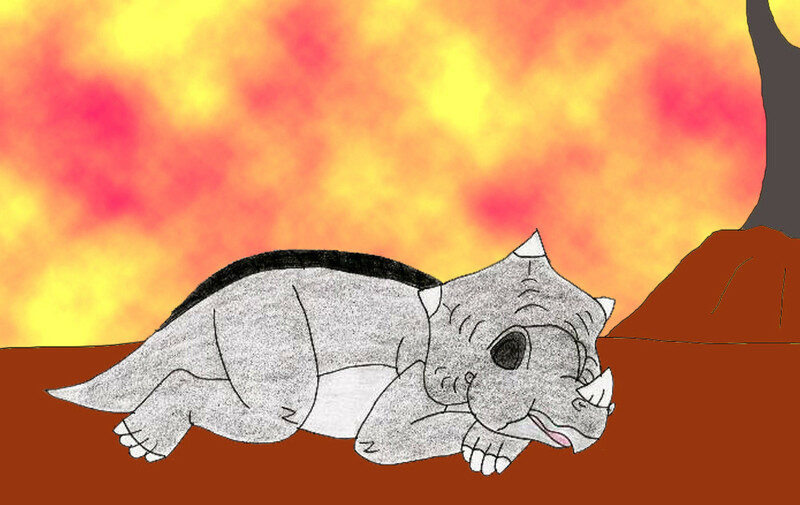 Long story short I got the idea for that name from these dino story cassettes I had as a kid, and one of the characters was a little girl Triceratops called Tracey. I also changed her design and colour quite a bit, to make it easier to tell between her and Topsy. Topsiea: Now now you 2... You should be happy that your children have made friends with each other. Tracey: Yes Topsy dear, we should be pleased that their getting along soo well, and not constantly bickering like you and Topi when you were children! Topsy: *SIGH* Fine then!... I'll look passed the differences between me and Topi for this... Seeing as he and his son is a fellow three-horn. Topi: Oh yeah here we go you and your stupid prejudice rubbish again! Topsiea: Alright now Topi, this is suppose to be a happy moment as we've all parents now. Anyway what are you going to name your 4 daughters Tracey? Tracey: Well we've going to name this one Cera. What are you going to name your son Topsiea? Topsiea: Oh we've named him Bambo. Awwwwww, ADORABLE! I LOVE this! And their meeting looks like it's going good so far. Great! You I think it would have made a good film if Cera met a boy three horn. I'm sure you would! I can just PICTURE you guys charging at things together , and you probably cautioning her about catching that bug in the first film. Yeah I can picture myself saying " Oh mind out Cera those bugs... *sprays her in the face* "Spray purple goo....."
I'd also advise Littlefoot to get out of there fast when Cera's dad shows up. I'd say "I'd better get out of here quick, Cera's dad can turn REALLY nasty.."
That'd be really funny, and it'd be nice to avoid the unpleasant meeting with Cera's dad. 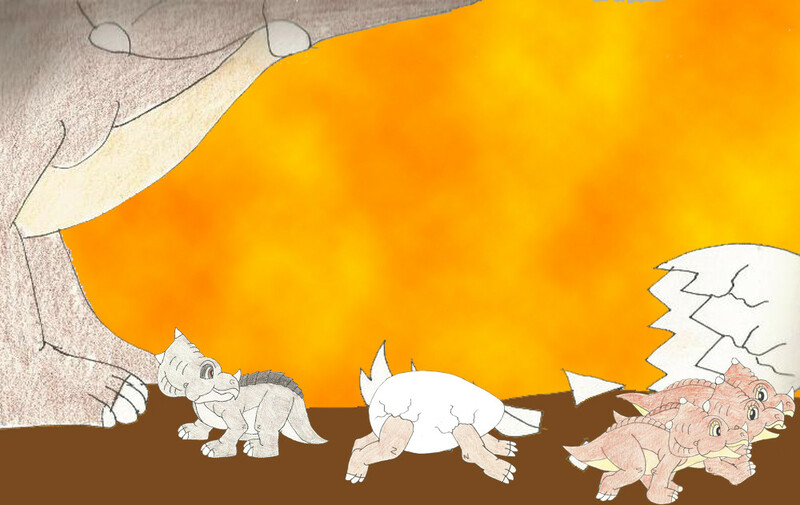 Yeah as I said I would have had good parenting and show a bit more respect to the dinos. 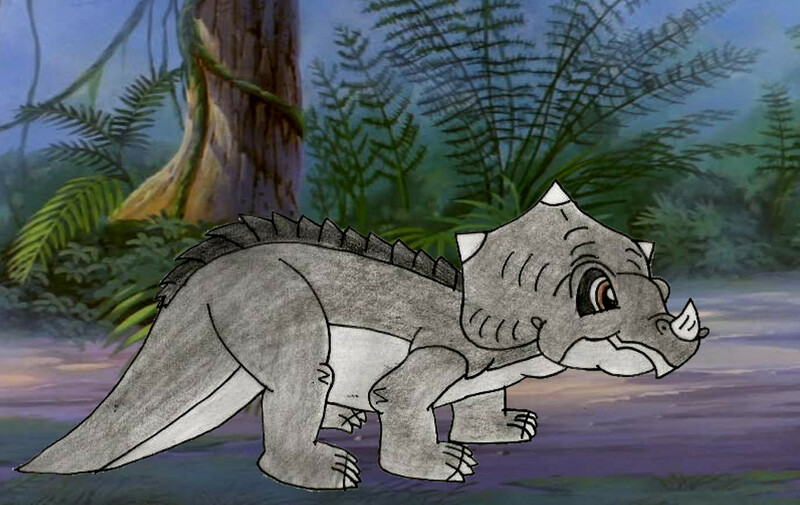 I can also picture Littlefoot over hearing both me and Cera laughing when he's about to tuck into the tree-star. Yeah, with another male in her life, she'd probably be able to laugh at the little things like getting squirted. I can imagine one of you starts laughing and then you both start doing it. I thought as this topic is of what the films would have been like if I were a character, I thought I'd do the 1st movie poster with Bambo with the gang. Sweet! This looks great, and I think Bambo would be a good addition. 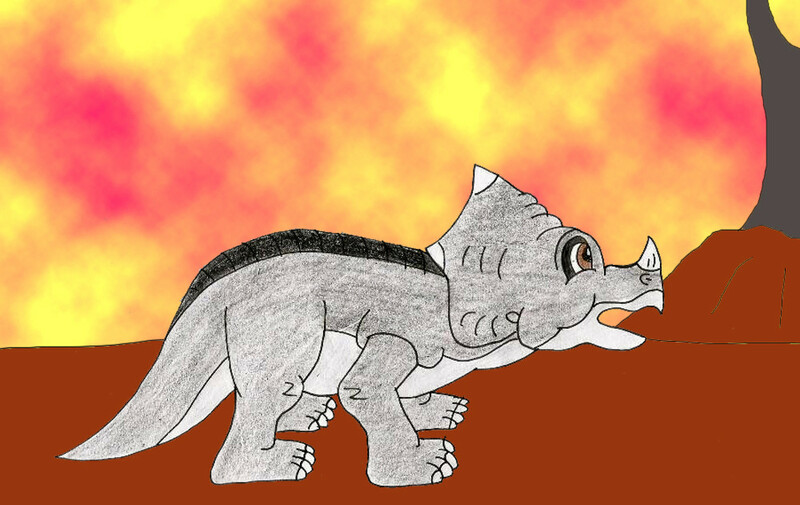 Yeah, he's be kinda like a dinosaur version of Josh from my fic. I figured. He'd be great as a charge practicing partner for Cera, too. Here's Littlefoot seeing Cera and Bambo who are playing together, for the first time after hearing them laughing near by. And then Bambo tells Cera as she's trying to ram the bug. Bambo: Wow! Steady on Cera it's only a bug! 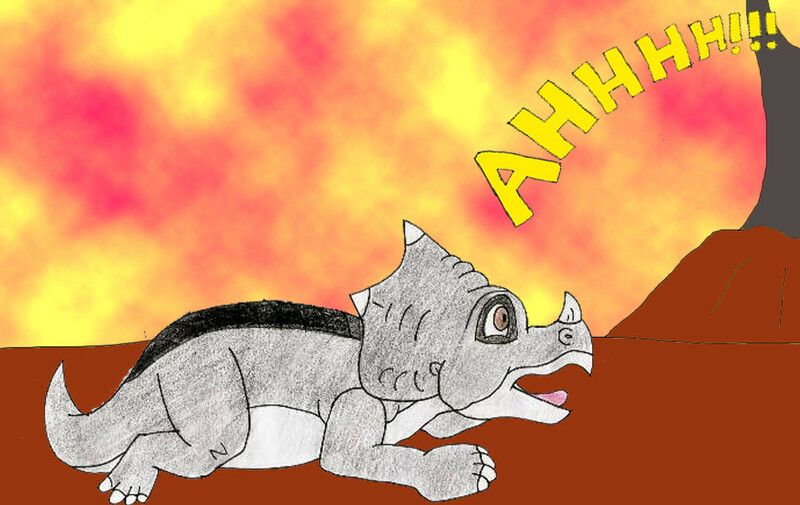 Then Bambo tries to warn Cera about that bug she's chasing has a surprise attack. "Oh careful Cera those bugs... *sprays her in the face* Spray purple goo..... Hey look a long-neck. " 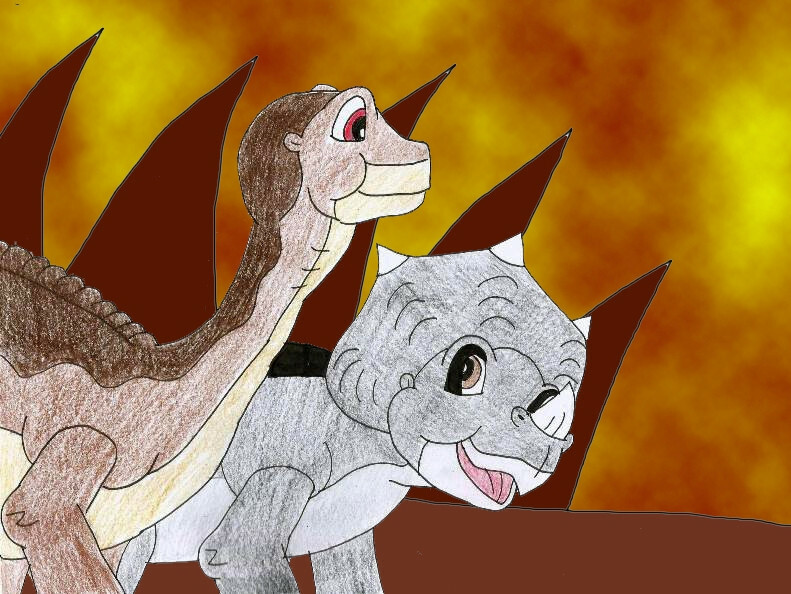 Here's Bambo with Cera as she prepares to charge at Littlefoot. Bambo: Cera... What are you doing? Your not going to charge at him!?" 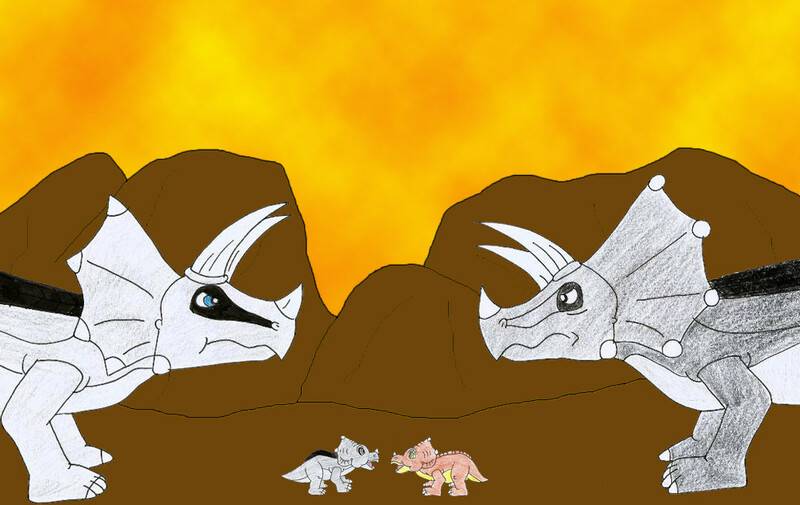 Here is Littlefoot and Bambo's first meeting, and Bambo is telling Littlefoot just after A-hole-sarus aka Cera's dad shows up. Bambo: "You'd better get out of here quick, Cera's dad can turn REALLY nasty.". 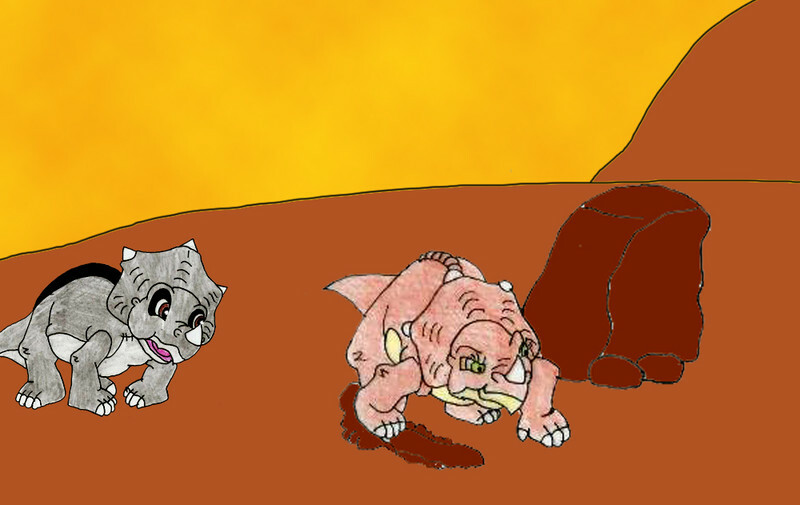 So Bambo tells Littlefoot to follow him and takes him back to his mum and grandparents, and away from Topsy. Bambo: Come follow me I'll take you back to your herd. Look I'm sorry for the way Cera behaved back there... She and I are close friends, But I don't like her dad. 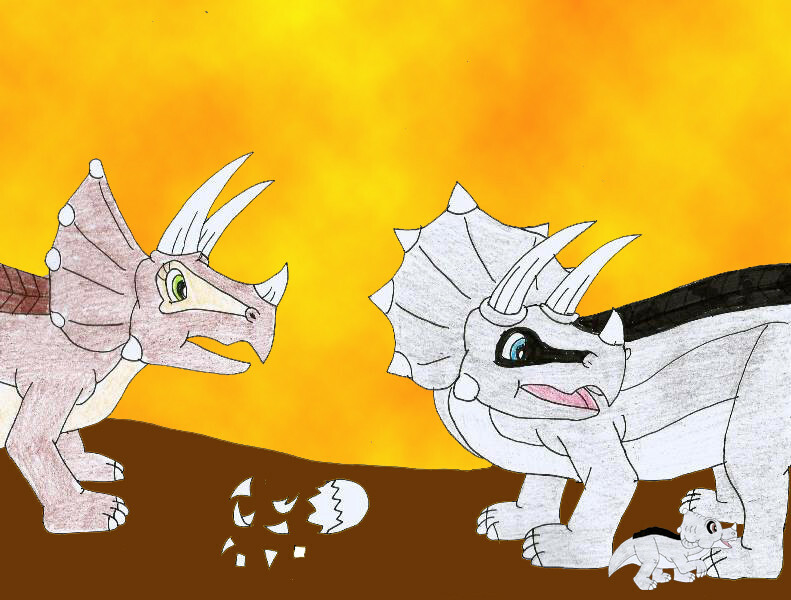 He tends to fill Cera's head with all this nonsense that three-horns are the best and shouldn't interact with other dinosaurs, and GOSH is he bad tempered.... My dad can't stand him. Oh my names Bambo by the way. 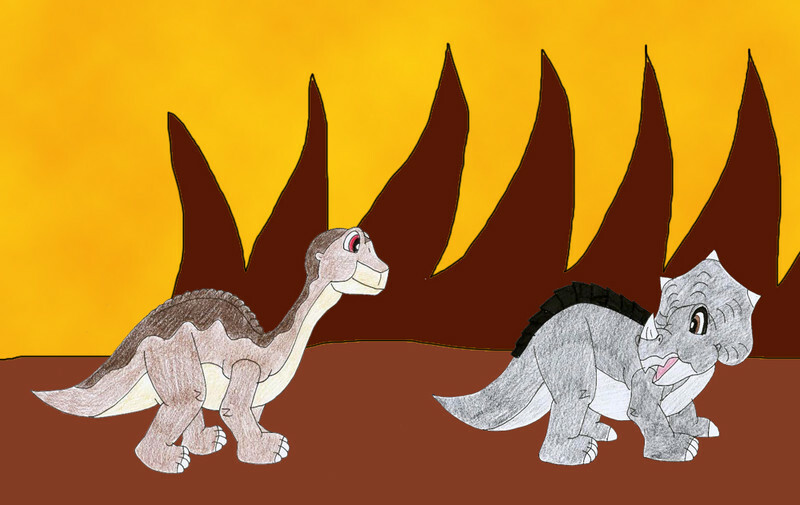 Littlefoot: Well my names Littlefoot, are you going to the great valley as well? Bambo: Oh yes we are. From what I hear all leaf eaters are heading there. 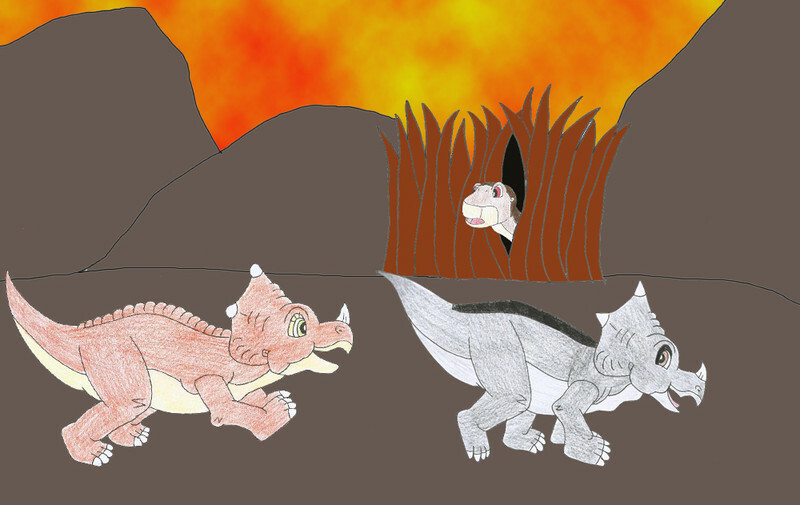 So Bambo guides Littlefoot back to where his mum and grandparent's are. 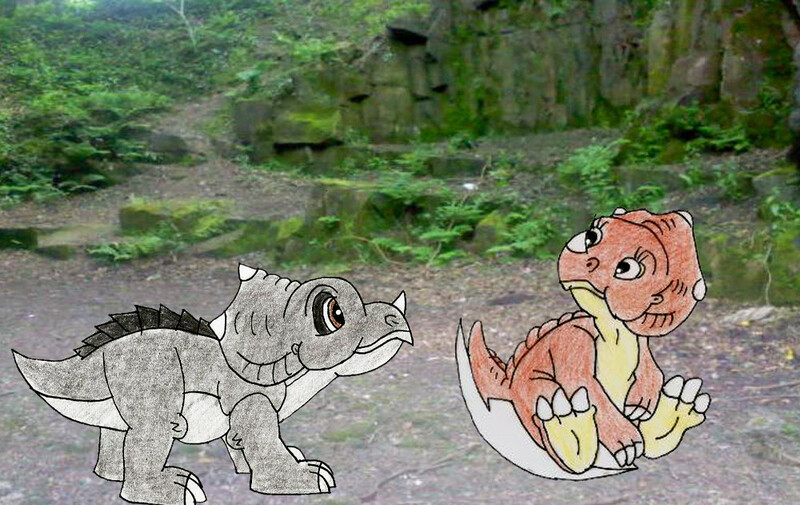 Littlefoot's mum: Littlefoot come along now. Topsiea: Bambo, we've moving on now. 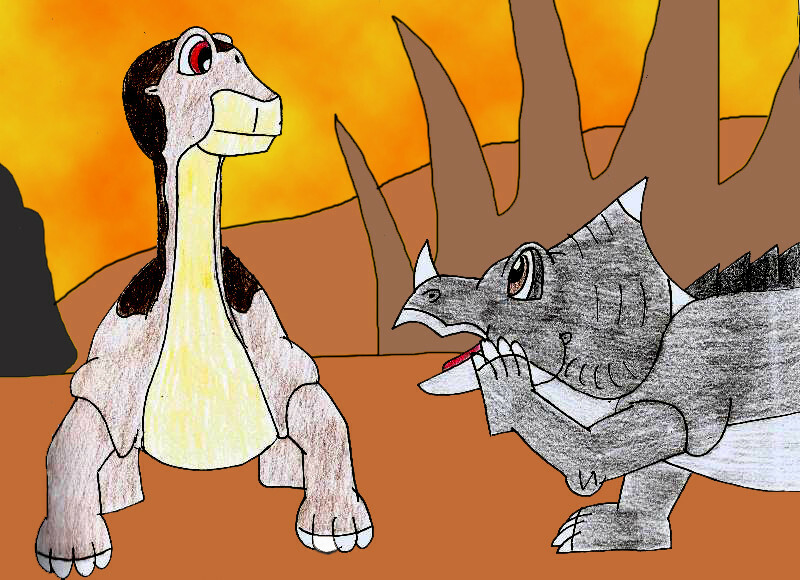 Bambo: Well see you then Littlefoot, maybe we'll meet again when we finally reach the great valley. Littlefoot: Yeah. Well bye Bambo. After his meeting with Littlefoot and seeing Cera's dad fill her head with crap about Three horns not playing with long-necks. 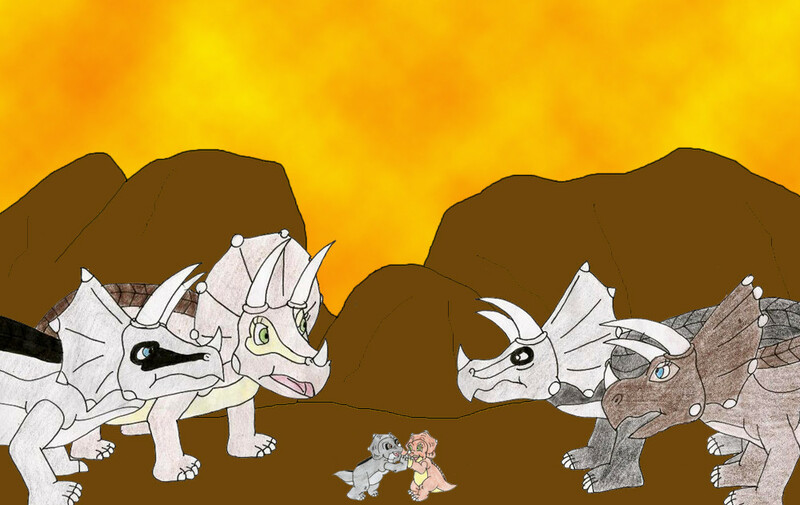 Bambo gets called for by his mum and dad, and he asks with Topsy is soo touchy with other types of dinosaur. And his dad tells him he's always been like that since he was Bambo's age and even then he and his mum didn't like Topsy. Topi: I saw what you did there helping that little long-neck. You did the right thing getting him away from Topsy. 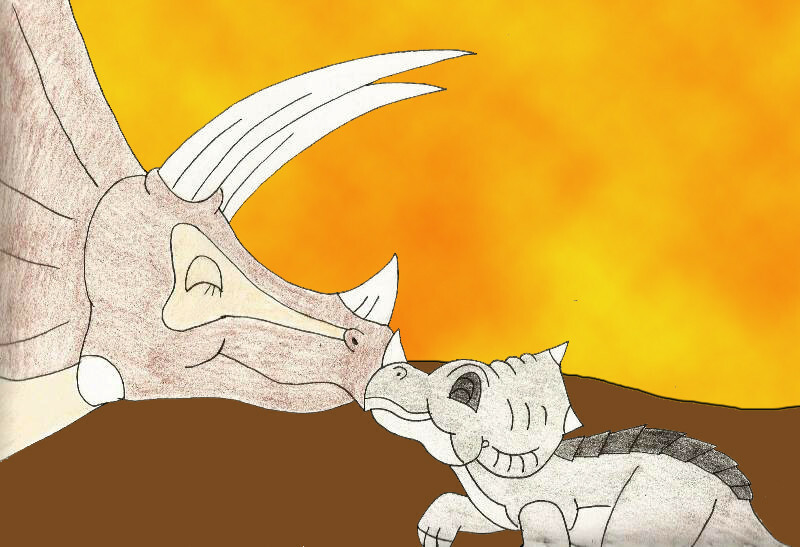 Bambo: What is it with Cera's dad and not liking other dinosaurs, and thinking Three horns are the best? Topi: Oh he's always been like that. Ever since he was your age, he was just as insurable back then and all. I don't know what his deal is with long necks. There the most peaceful and non violent dinosaur you can meet. When me and your mum were your age we got friendly with some young long necks one time. 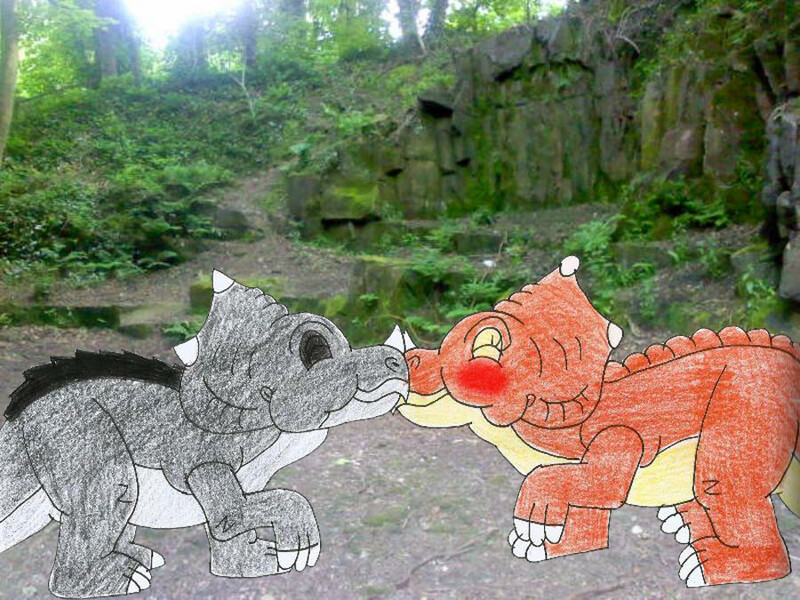 Bambo: Oh but I thought other dinosaurs weren't supposed to interact with each other? 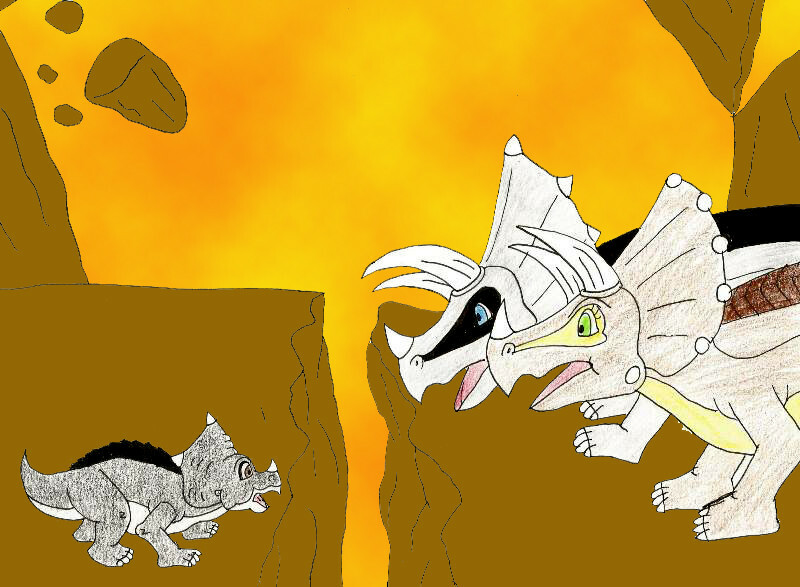 Topi: Ah well we were in a bit of trouble at the time and we had to work together to get out of it.. You see me and your mum think it's ok to work together with other dinosaurs in tough situations. 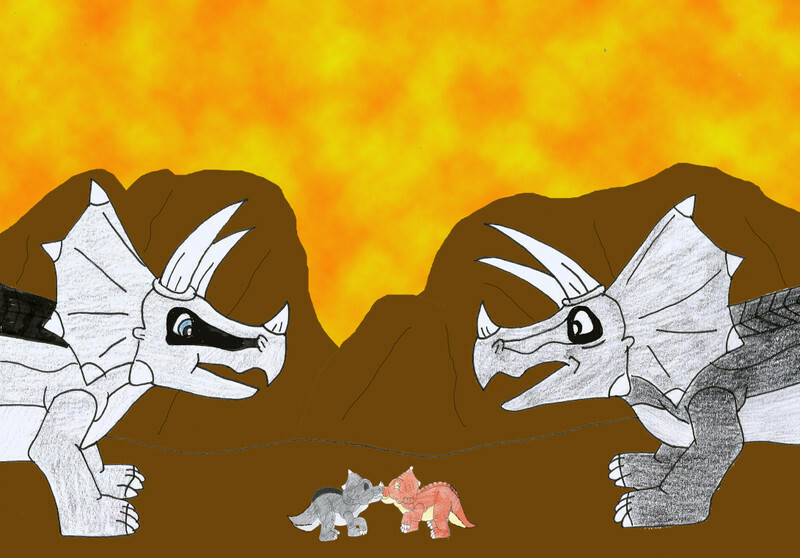 So bare in mind Bambo, if you ever get in trouble along side others dinosaurs, it's alright to cooperate with them. Here's more new pics of Bambo in the events of the first LBT movie. This one of him been separated from his parents during the earthquake scene. Here's a more comical scene. 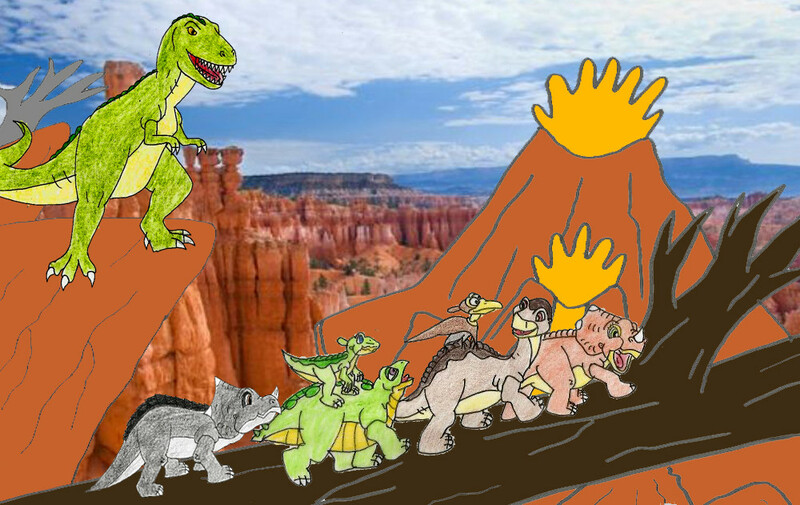 This is when Littlefoot and Ducky first meet Petrie and Littlefoot goes all melodramatic and yells like a crazy asylum inmate and sends Petrie flying and howling. Bambo is not too far away, taking a power nap after wondering around looking for a why back to his family. When he's rudely awoken by Littlefoot's yell and Petrie's howl echoing. Bambo: Huh Ahhh!..... What the heck was that!? 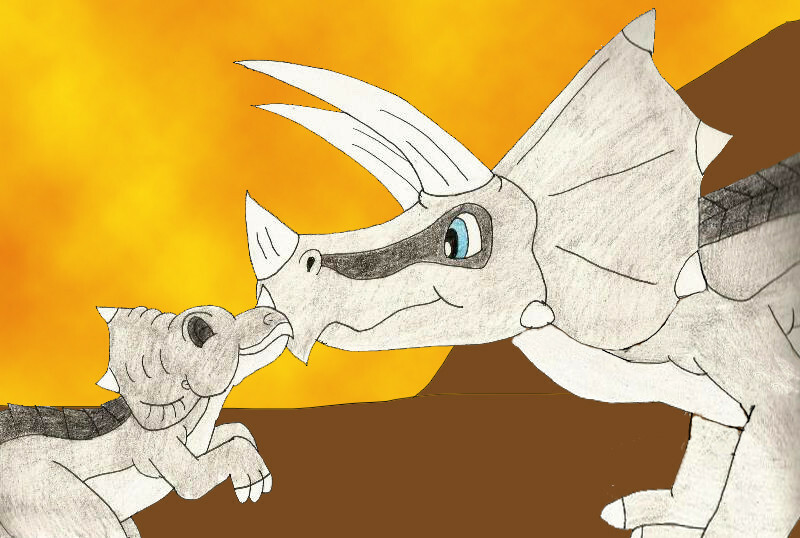 And this one set before he reunites with Cera and later Littlefoot and the others. Were he hides from some raptors/ fast biters. 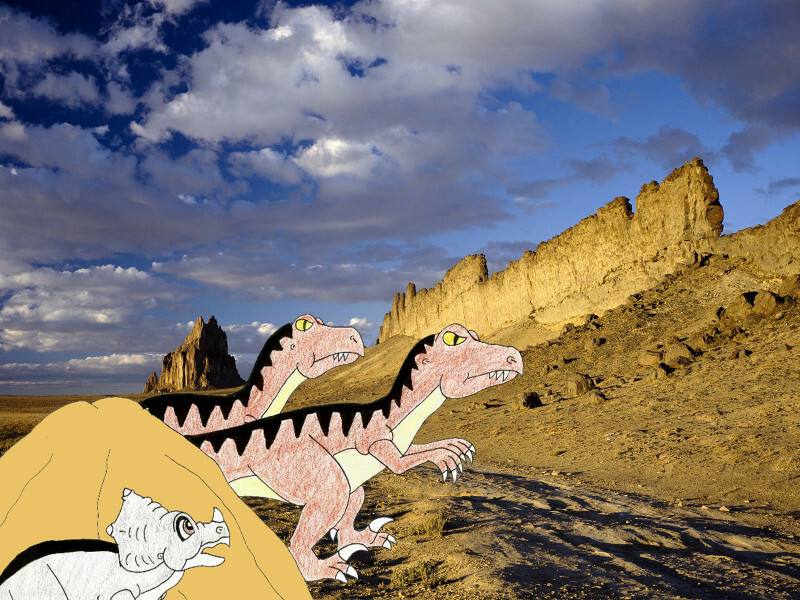 Bit like when Littlefoot, Ducky and Petrie hides from that dimetrodon. 1. This is really cute. I can tell she's freaked out, though it almost looks like she's happy. I like how it looks like Bambo was already looking for Cera. 2. This is equally cute. I love how their different personalities are a feature here. Bambo politely holding back his laughter, while Cera just laughs out loud anyway. 3. This one is very cute, and a decent recreation of that particular scene. I can DEFINITELY see this happening. 1. Yeah I can imagine myself walking around the wasteland saying" Oh I haven't seen anyone since that earth shake, I feel like I'm the only one left and.." Then I see Cera running out of the cave. "Hey, it's Cera. Hey Cera!" Then she runs past me shouting "Bambo Ruuuuuuun!" And I'm like "Oh wait Cera what's wrong?!" Then I hear roaring from the cave. "Oh!... Cera wait for me!" Then I run off trying to catch up. 2. Yeah as I said I laughed just as much as Cera dose at that scene as a kid, mainly cause Petrie sounds like he's having a fit when he picks the leafs off. But if I was actually there, I'd be polite and try not to laugh, and be apologetic if I did LOL. 3. I can picture Cera after been sprayed looking at me with a annoyed looking showing she's thinking "Why didn't you tell me sooner. And I look and given an embarrassed oops grin at her. Which LBT character do you think I am?